This is our Final Family Series show! Join Mermaid Theatre for this wonderful puppet show, entertainment for the whole family. 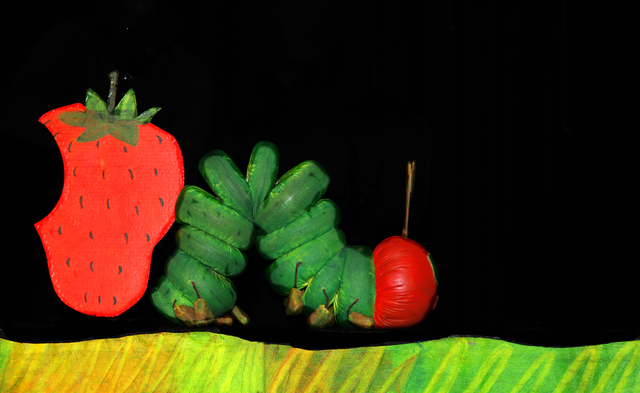 Three beloved stories by Eric Carle, award-winning children’s book illustrator and author, are retold on stage through the magic of black light and fanciful puppets. The Very Hungry Caterpillar follows the wonderful adventures of a very tiny and very hungry caterpillar as he eats his way through an amazing variety of foods on his path to becoming a beautiful butterfly. High up in the sky, Little Cloud playfully transforms himself into various creatures, including a sheep, and an airplane, a shark and more. The Mixed-Up Chameleon is bored with his life, sitting about predictably changing colour all day. Following an adventurous trip to the zoo, he attempts to emulate the beautiful animals he sees before coming to the conclusion that there is value in his own unique self. At the Visitors Centre and at the door before the show!